If you’re stuck, why not book an in-store Mac training session with one of our experienced Apple Certified technicians to get you unstuck? Whether you’ve hit a stumbling block with your hardware or software, we’ll talk through the issue. No jargon, no waffle – just a friendly demonstration of how to fix it (and make sure it doesn’t happen again). Do you have a new Apple computer or iDevice but you’re not sure how to get the most out of it? You wouldn’t buy a Rolls Royce without someone showing you where to put your champagne flute, so why not let us show you around your new Apple product? We’ll demonstrate new features that you may not know about, and make sure you’re comfortable with how it all works. 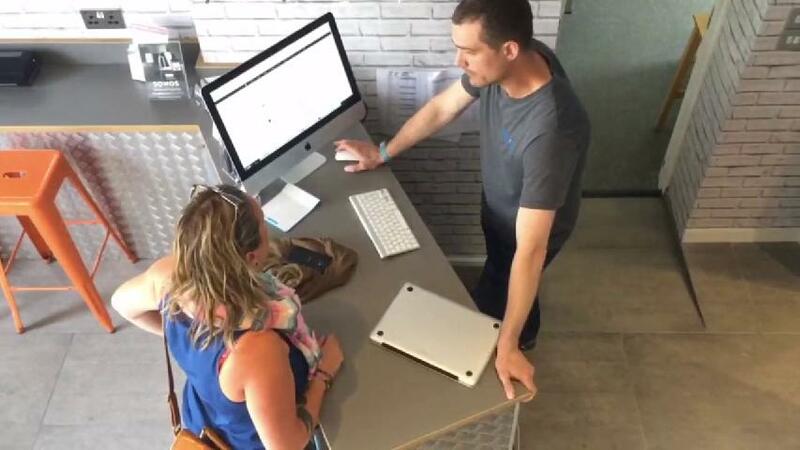 In-store Mac training is bookable in half-hour blocks costing £37.50. We also offer discounts if you’re happy to book a series of four sessions in advance or a two-hour session. Please see the table below for different session prices. You can book your session using the form below. If you have trouble, please don’t hesitate to contact us. Please use the form below to book you training session/s. Once you’ve booked and paid, we’ll be in touch to confirm the session and you’ll be well on your way to being a Mac expert yourself! Sometimes it’s easier to learn on your own Mac while in an environment that’s familiar to you. If you’d prefer to learn more about your Mac in the comfort of your own home or office, you can book an on-site Mac training session quickly and easily.